6 fab gifts sets, so whether you're buying for a loved one of simply want to try some of the newbies yourself here is my guide to the entire range! So here is my haul! Isn't it such a bright and colourful selection. Scrubee Body Butter | How cute is this little guy?! On one side you have a gently smoothing exfoliator and on the other is a luxurious moisturiser. The smell is incredible of sweet Honey & Shea Butter and is one of my favourite new Lush products in a long time! It seems to have become just as popular with other Lushies and amongst the Lush staff who were raving about it when I was in the shop. "Meet Scrubee - the newest buffer on the block. With all that hydrating honey and cocoa butter he may seem like a real softy, but don’t underestimate his polishing power - he’s packed full of ground coconut shells and ground almonds to give you a gentle, effective exfoliation." Yummy Mummy Shower Cream | I loved this one when it was out last year so I was excited to see it return. A gorgeous purple, creamy lather and fragranced with Vanilla, Tonka Bean, Orange & Geranium makes it smell like a white chocolate cheesecake in my opinion! I've heard people say this reminds them of the scent of the exclusive, but ever so popular, Roller Bath Bomb so if you love that then this is for you. "Sometimes a hug is all you need - and this embrace of sweet tonka absolute and conditioning Fair Trade organic cocoa butter is the perfect way to get your fix. Luxurious lathers of Brazilian orange and geranium oils will leave skin prettily perfumed with their nostalgic floral fragrance. Add a decadent drizzle to your morning routine for a paradisiacal pamper." 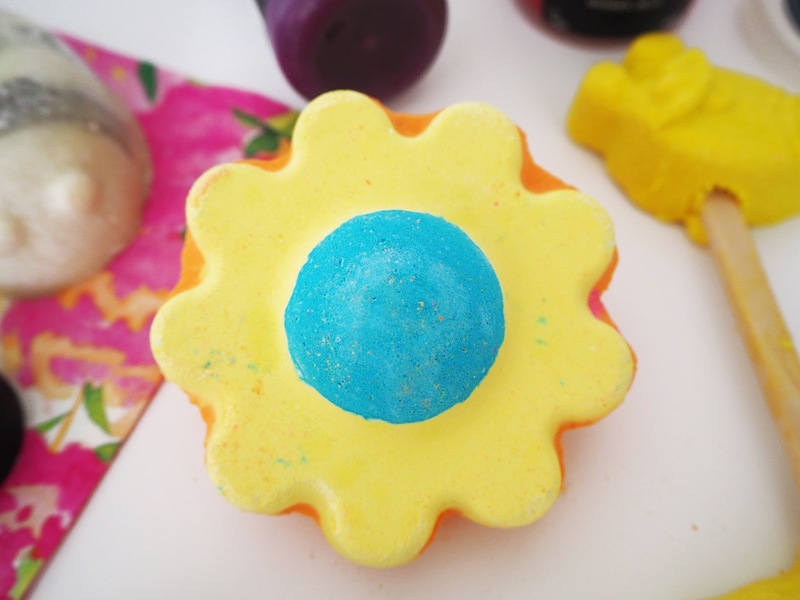 Ups-A-Daisy Bath Bomb | This is a newbie for 2017! I love all the different shapes & designs Lush manage to keep creating with their Bath Bombs and Bubble Bars. Orange one side and yellow the other so it looks amazing when it's fizzing away in the bath and with a gorgeous floral scent to match it's appearance. "Have you ever smuggled your dirty laundry basket back into the house on a visit to mum, or not been allowed over the doorstep without first taking off your mud-drenched - “Oops a daisy” - socks? 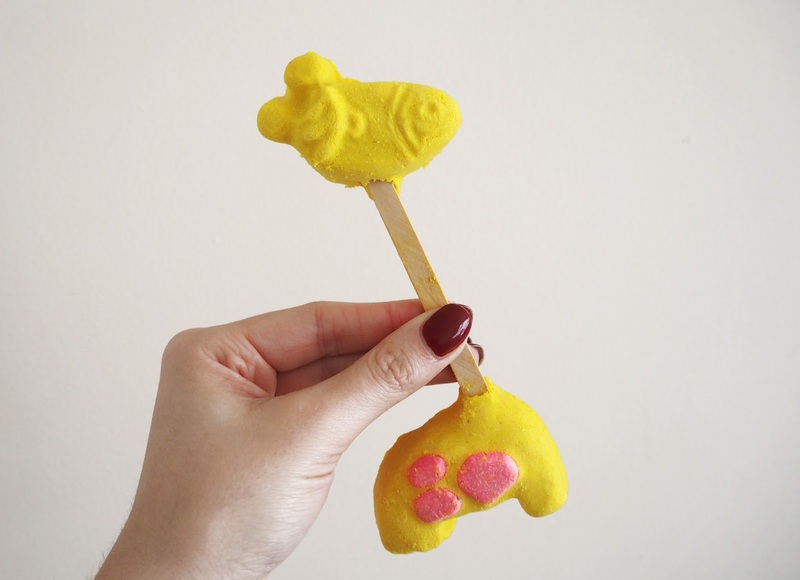 If so, this cheerful, grounding bath bomb is designed for you (and your mum). It slowly dissipates beautiful essential oils - soothing rosewood, delicate rose and bright orange oil - for a fragrance as gently sunny as a Sunday afternoon." Baa Bar Bubble Bar | "Baa Baa Bubble Bar have you any wool?!" - what I instantly hear when I see this. Yes, I'm weird I know! Another cute little character that Lush have newly created for 2017. I don't remember that Lush have ever made a sheep before but love this little darling! As the bubbles are released the scent is beautifully floral but also sweet almost like Parma Violets. If you love the Ladybird from the Valentines range, one of my absolute favourites, then I recommend you try this one! 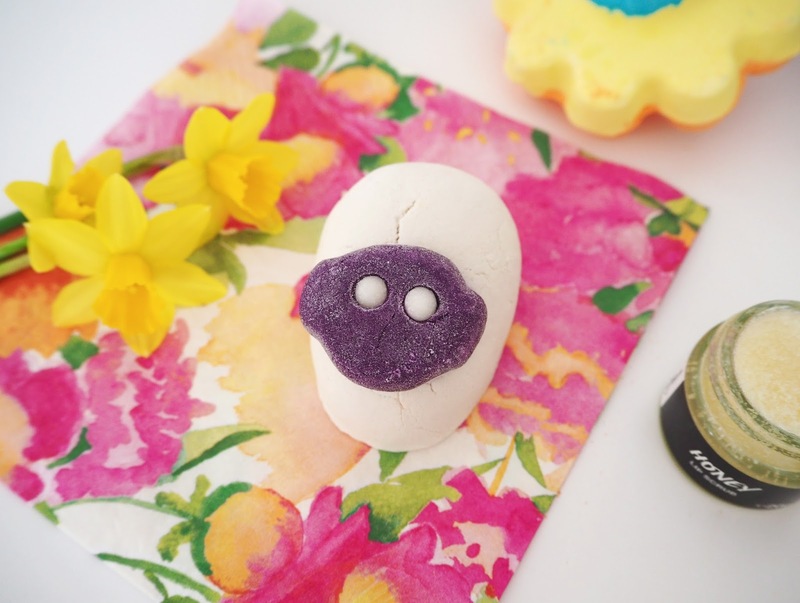 "This adorable little critter wants to tuck you up in a blanket of comforting lavender, rose and ylang ylang to help you bed down for the night. Fluffy clouds of soya milk cuddle you close and bring softness, while clove bud oil adds toastiness and warmth as you soak. A hint of bergamot teases out the grassier notes of fragrant lavender and violet, promising sweet dreams and a fresh tomorrow." 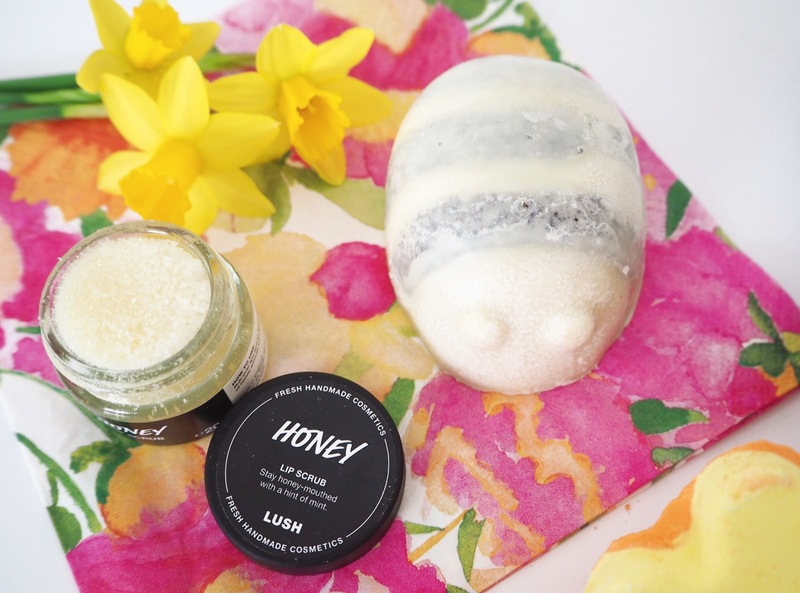 Honey Lip Scrub | I have a bit of a thing for Lush's lip scrubs! 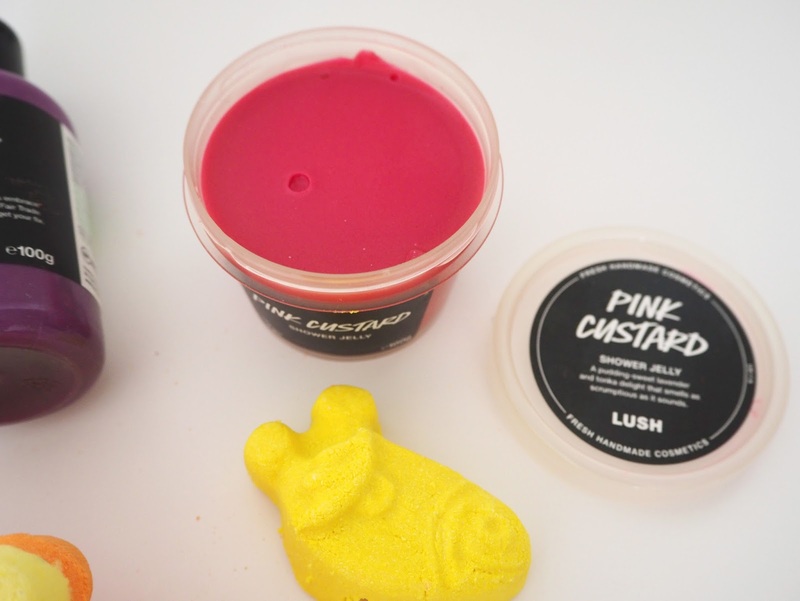 Let's face it all their products smell good enough to eat but they are the only products that you can actually taste (as well as the lip balms) without making yourself ill! I think I've tried almost every single one so far, I have a draw full and use one every other day to keep my lips soft & smooth. This one smells like gorgeous honey cut through with a hint of refreshing peppermint it's become one of my new favourites! "Stay honey-mouthed and sweet-lipped wherever you go. 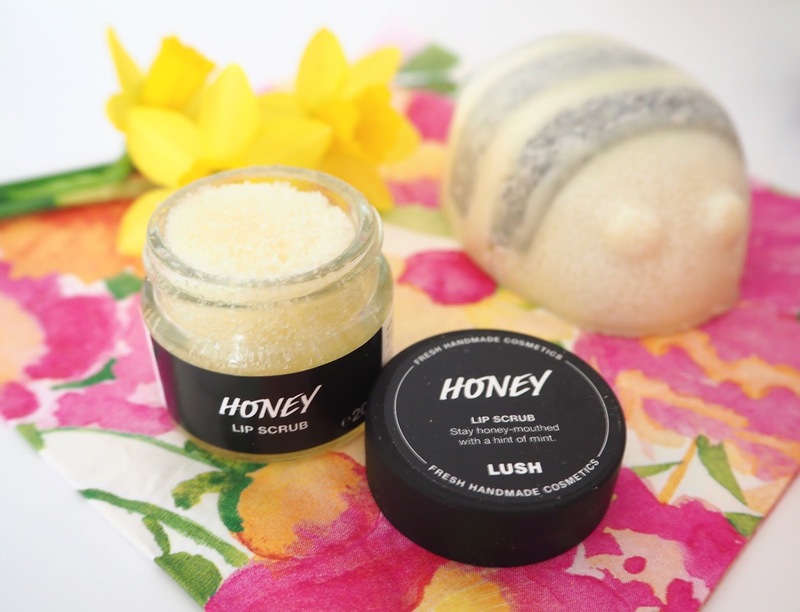 Rub this sugary scrub over your lips and let spoonfuls of honey smooth your smackers. The menthol of peppermint oil cools and freshens, while sweet wild orange oil gives you a buzz. Get your honey for nothing, get your lips for free." 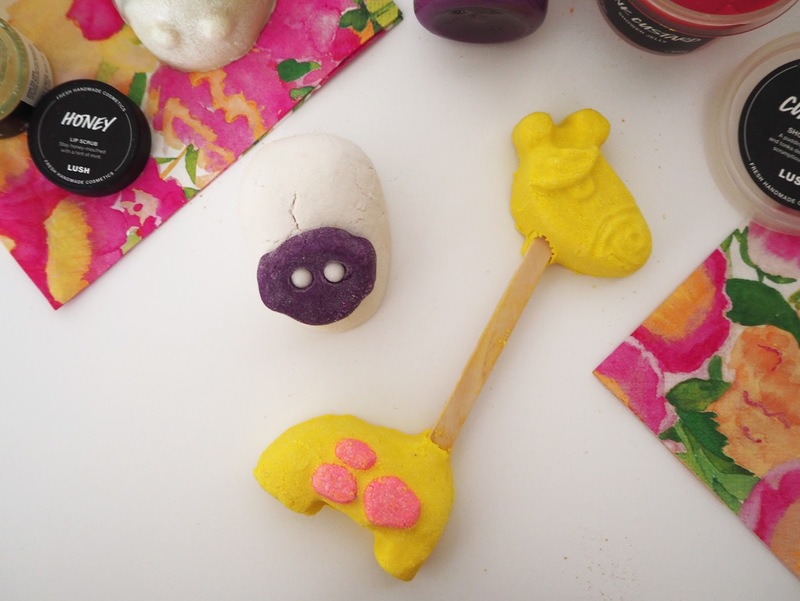 Elsie The Giraffe Bubble Bar (You're Havin' A Bath) | I was so excited when I realised this was a Giraffe (it was hard to tell at first when they were all in bunched together in the store) and he is so adorable! This one is a real vibrant and zesty fragrance as it's full of citrus oils including lemon, lime and grapefruit. He is also reusable, you just hold him under the tap to create the bubbles so you should be able to get multiple uses out of this little guy! "Keep your feet on the ground and lose sight of your head in the sky. Heads or tails? Choose one end of your Geraneous giraffe to swish in the water and under the tap, then set her aside for another majestic bathtime. Create a scrumptious-galumptious tower of bubbles as lemony yellow gallops across your bath. Lickswishy citrus will leave you feeling scrumdiddlyumptious. Marvellous lemon and lime oils refresh your inner sparkle, as grapefruit oil lifts you to lofty new heights. Wash your neck, scrub your hooves, polish your legs. Reach new bathtime heights." Pink Custard Shower Jelly | Yet another new creation that got me excited this year! I think mostly because it's pink and the name pink custard drew me in, I thought oooh sweeties! It's more potent with Herbal Lavender than I was expecting with less of the sweet Tonka notes coming out but none the less it's really lovely and relaxing. The girls pointed out to me in the shop that the fragrance is similar to Think Pink Bath Bomb. I always say that these Lush shower jellies are a bit like bathing with flubber! They're not that easy to control, they have a mind of their own. They last flipping ages so are great value for money! Top tip: break a bit off jelly, put it In a sieve and hold under the running water whilst filling your bath. It will act like a Bubble Bar! I think doing it this way created maximum amount of bubbles too. You can do this with most of your Lush products, Soaps, Bubble Bars, Shower Jellies, Shower Creams and Fun. If you add multiple things to your sieve you can create your own Lush Cocktail! "What do you get if you mix jelly and custard? No, not a strange dessert hybrid that’s better left in the bowl, but a pudding-sweet delight that smells as scrumptious as it sounds. This is no school-dinner reject - it’s for washin’ not gobblin’! Swish and swipe its tantalising tonka and lavender jiggliness over your wobbly bits and make showering as fun as it was way back when." A few bits from the collection that I didn't pick up include the Mum Bath Bomb, the Sunrise Soap and Your Mother Should Know Bubble Bar. They also have some amazing themed gift sets and pretty flower knot wraps available too, I particularly love this Poppy Printed Knot Wrap! I always think a fabulous alternative gift idea is buying one of their pretty knot wraps and wrapping a bath bomb inside and then the knot wrap can be used as a scarf afterwards too! You can shop the collection online here as well as in stores. 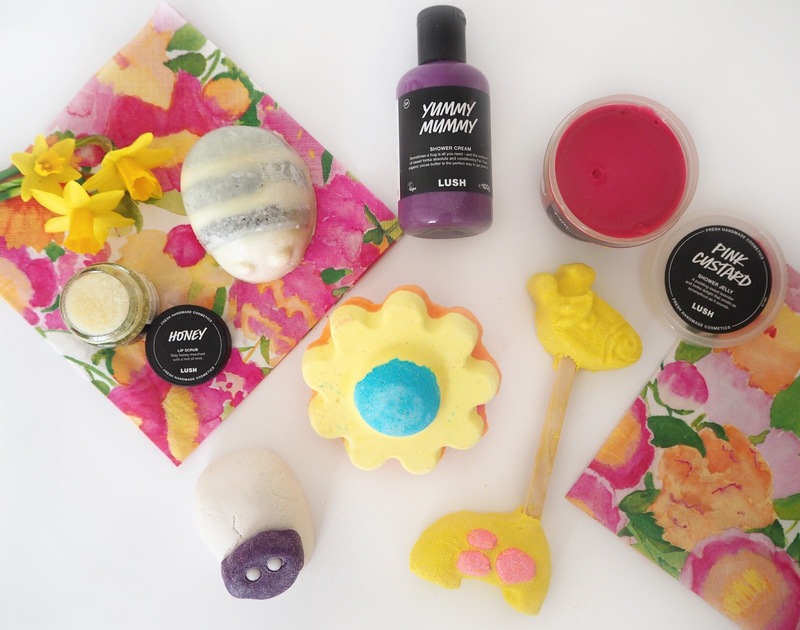 Be sure to stock up whilst you can as these beauties will start to dwindle from the shops after Mother's Day there is also the Easter Collection out now as well so look out for another themed Lush post coming soon - it's a busy time for Lushie's!! What are your favourites from the Mother's Day range this year? Great present idea! And thanks for the tip with jellies.